Saturday December 30 1911. It was mild today. I gave the house a good sweeping and cleaning in forenoon. Went to town at 1.15 and got some things we needed. I took a car north and went up to Nell Swishers to see Susan Fletcher Garrett who is here having her eyes treated I got home at 3.45 and did sewing in the evening. 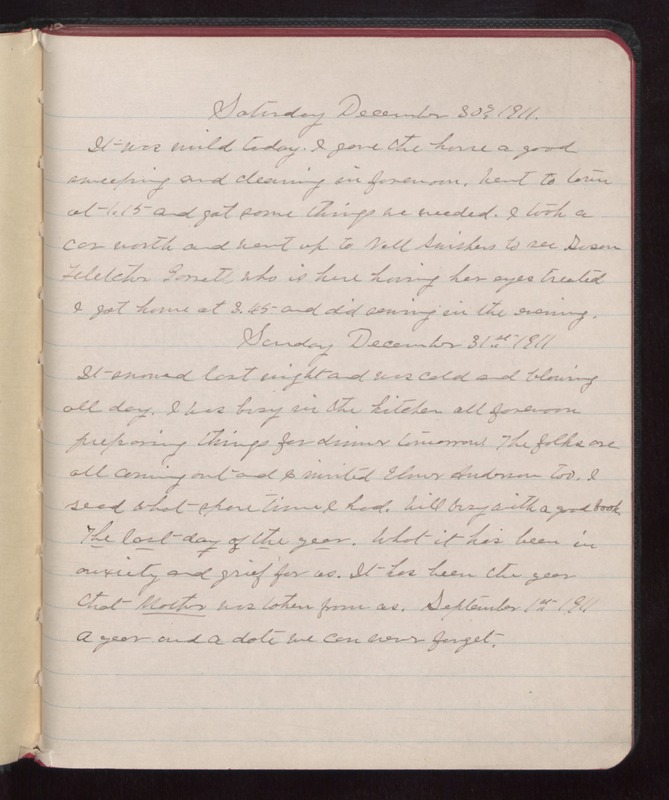 Sunday December 31st 1911 It snowed last night and was cold and blowing all day. I was busy in the kitchen all forenoon preparing things for dinner tomorrow. The folks are all coming out and I invited Elmer Anderson too. I read what spare time I had. Will busy with a good book. The last day of the year. What it has been in anxiety and grief for us. It has been the year that Mother was taken from us. September 1st 1911 A year and a date we can never forget.